It is Earth year 2223, but the Earth, along with the entire solar system, is gone. Liam and Phoebe, having barely escaped our exploding sun with their lives, are in stasis for the decade-long journey to the rogue planet Delphi, where they hope to meet up with the rest of the human refugees, find help for their injured parents, and pass along the devastating things they discovered on Mars: that someone destroyed their world intentionally, and that that someone might still be after them, trying to finish the job. Phoebe is carrying her own dark secret. One that finds her waking up secretly at various points in their journey, changing their path through space. One that will decide the fate of the human race, and many more besides. One that, very soon, she must reveal to Liam, whether he’s ready for the truth or not. The second volume in Kevin Emerson's thrilling sci-fi epic is a bold and terrifying quest into the outer reaches of time and space—one that will change our heroes, and their friendship, forever. 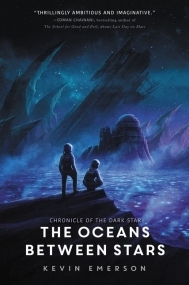 A trust and friendship-centric second installment in this middle-grade sci-fi series, The Oceans Between Stars is fast-paced follow-up to The Last Day On Mars. Once again, the book opens with an exposition meant to explain alien things and ideas with manageable human analogies—using a touch of matter-of-fact wit and irony (vaguely Douglass Adams styled, san silliness.) Just as with the vast majority of the first book, the parents are out of the picture. Still badly injured and kept in suspended animation for the long journey to their hopeful new home. It’s up to Liam, Phoebe, and their trusty panda-shaped android, JEFF, to ensure they actually make it to their destination. A number of information tidbits come together in this book to form some fairly big reveals, so that was rewarding to see. All these details turned out to be well-threaded ahead of time, so there isn’t the sense that any of it was forced. Those hoping for clarity on Phoebe’s origins will not be disappointed. And while some of the revelations provoke obvious philosophical quandaries, there isn’t too much time spent watching 13-year-olds attempt to soapbox over them. The primary focus is ‘run, outwit, survive,’ and while the overarching plot has grown in complexity, it never gets too far from that rooting. On the downside, the splitting off of multiple realities, while a useful plot device in some cases, can become a bit confusing at times. Especially as Liam begins inexplicably stepping outside of his own timeline and dimensional limitations. (The first book only involved time travel… er… maybe time-voyering is the more accurate term? So, I’d expect some readers may not love the complications brought on by the addition of multiverse concepts.) Bottom line: It isn’t quite as easy to follow as the first book in the series. On the upside, the slow and drawn-out portions of the first book (particularly toward the beginning half) don’t pull an encore in this book. While there is still some scene drag here and there, there is notably less dwelling on the mundane details of spacefaring/colony life. It also stays fairly consistent to the previously established respect for realistic tech and physics seen in book #1. Though this book doesn’t stand alone nearly as well as its predecessor, it does answer a number of pressing questions generated by the first book. It also ends on a note sure to propel readers on to the next installment.